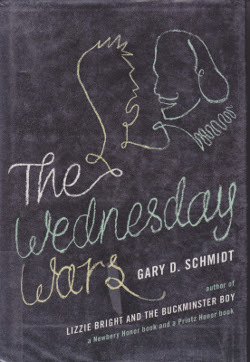 The Wednesday Wars (Schmidt) was not on my to-read shelves. In fact, it wasn't even on any shelf. Rather, it was on someone PaperBackSwappers shelf before mine. I do wish I could remember what rabbit trail I followed that caused me to end up with the book. Especially now when I've been in a half-a-year-long book cull-and-purge. But it made it onto the shelves very recently. The lure of the juvenile fiction book was that it involved Shakespeare, seventh grade, and school. This combination piqued my curiosity. Even for an adult, The Wednesday Wars is humorous, sometimes downright laugh-out-loud funny. The setting is Long Island, New York during the late 1960's. I could relate because I was in the seventh grade in 1968, but our whole school set up was different. I smiled my way through this book as class assignments were given; if only my schooling had been half as good as the protagonist's. How I wished I had had a Mrs. Baker in my life. The Wednesday Wars is also a coming-of-age book, a second one in a row that I've read, and set in New York, too. If you know no Shakespeare, some of the humor will be lost on you. But even if you know a bit, you will appreciate how lines written in the sixteenth century are quickened and applicable in the twenty-first century. Reading this book stirred me again to strive to read through the plays I've already read again, and to add the others to the to-read list. I walked home under gray clouds whose undersides had been shredded. (Can't you just see that?) They hung in tatters, and a cold mist leaked out of them. The cold got colder, and the mist got mistier all through the afternoon, so that by suppertime a drizzle was making everything wet and everyone miserable -- especially m y sister, who believed that she had hair that belonged in southern California, where it would be springy and bouncy all the time, instead of in gray, cold, misty Long Island, where it just hung. As always, I get author-curious after reading a good book. And after reading bio sketches about Gary Schmidt here and here, I really wish I had had him as a teacher. If you have middle schoolers, convince them to read this book! And if you are like me, and like an interesting juvenile fiction once in a while, tolle lege! I was really surprised at how much I enjoyed this book. Glad you enjoyed it too. A sort of "follow-up" book is called Okay For Now, which includes one of the characters from Wednesday Wars. You must read Okay for Now! Thanks, ladies! I'm just now finding these comments, so I apologize for the delay. I will try Okay for Now!